The relentless march of industrialisation has driven mankind to the brink of extinction. In a world out of control, its resources leached by greedy manufacturing cartels and driven by voracious machines the size of cities, one man vows that if the world won't fix itself, he'll do it for them. His name is Renard™. Key to Renard's subversive strategy, code-named Industrial Strength, is The Engine™ - HGV™, Steampress™, Axel™ and Shift™ - a hard-bitten crew of freelance mechanical troubleshooters. They go where others fear to tread, into the heart of the monstrous machines teetering on the brink of catastrophic collapse. Together they must turn back the relentless march of industrialisation… by force if necessary. The Engine: Industrial Strength™ comes with a whole world of possibilities to explore in any number of different media. Colourful characters, dire villains, stunning and visually dynamic technology and a truly apocalyptic backdrop are just some of the key facets of this expanding license. 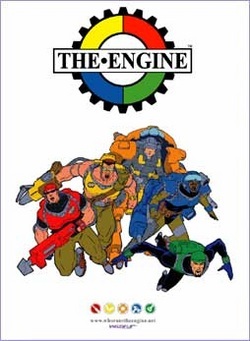 The Engine is ™ & © 2011 Simon Furman and Andrew Wildman. All rights reserved.